Car siblings are a relatively new phenomenon in India. Volkswagen and Skoda started it and now we have the brotherhood of Renault and Nissan. The French-Japanese connection is still finding its footing in India though it's the French who are now coming into prominence with the recently launched SUV, the Duster and now the soon to be launched sedan, the Scala. It is a rebadged Nissan Sunny, just like the Renault Pulse is a rebadged Nissan Micra. So if you had to pick between the two brothers, which one would you choose? With the underpinnings for both the cars remaining the same how does one differentiate? Let's try and simplify it. To tell someone you own a Scala would need at least a couple of reiterations. Brother-in-law or aunt? Unless you are the type who likes to order ka-bur-nay so-vee-nyo (Cabernet Sauvignon), Scala will be a bit stressful to pull off. To tell someone you own a car called Sunny wouldn't need any elaboration. The Sunny is a name with which Indians are comfortable with. Most of us know a boisterous friend called Sunny. The Scala is like Veronica from Archie comics when compared to the Sunny. The Pulse-inspired front end looks stylish with the smaller grille and sleeker headlamps with the Renault badge split halfway on the bonnet and the grille. From the side the Scala gets a chrome strip outlining the windows at the bottom. At the rear a thick chrome strip connects the tail lamps adding to the premium look. In India, chrome is cool and Scala has been sprinkled with it generously. The Sunny is like Betty. Doesn't attract attention but doesn't bother you either. The big grille and the large horizontal air dam give a lot of bulk to the front end of the Sunny. The side is without any distinguishing character. From the rear too the big bumper and big tail lamp assembly add to the bulky feel of the car. The Scala interiors are a copy of the Sunny. There are no tweaks to make it feel more premium. The only plus is that the top-end variant gets leather seats while the Sunny has to make do with fabric. As for features, refer to the Sunny, it's the same. The Sunny interiors are quite spartan and doesn't feel premium and that round centre console still takes some time getting used to. It gets electric mirrors, integrated stereo with aux-in input (no USB), driver seat height adjust, automatic climate control, steering mounted stereo controls, keyless entry, stop start switch, rear air blower, ABS and front driver and passenger airbags. The Scala diesel produces 86PS at 3750rpm and 200Nm at 2000rpm. It has sufficient torque for the highways but getting up a slope with four passengers, especially if you have come to a stop, requires using the clutch to build up the revs. The ride is plush over most surfaces except when the roads are really bad. The NVH levels are quite refined and you can hardly hear the diesel clatter. Renault has 80 dealerships out of which 50 are service centres. Nissan has, as of today, 64 dealerships and service centres across the country. The prices for the Scala haven't been revealed yet but we expect the top end variant to be around Rs 9.70 lakh. We are using the Micra-Pulse difference in price as a reference. The top-end diesel Sunny costs Rs 8.93 lakh, ex-Delhi. 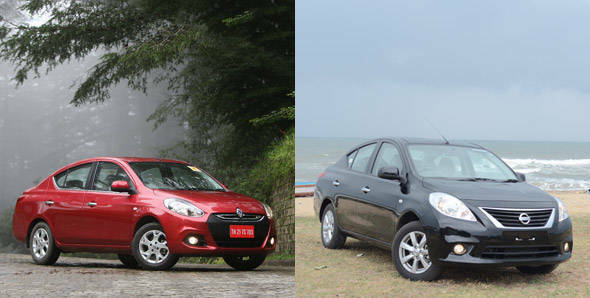 Renault Scala has much more appealing looks than the Nissan Sunny. The sleeker front fascia, alloy wheels and chrome spattering will appeal to the Indian customer. The Scala also gets leather seats. But with hardly any other features to justify the premium the Scala will charge over the Sunny, Renault will have to come up with a solid marketing campaign to get its numbers up. You can't stretch the caaaaaaar too far.